Key West Diving, a premiere diving and snorkeling charter service located off the coast of Florida, offers a variety of scuba diving and snorkeling courses. One of the most popular courses is the enriched air nitrox course. Diving with enriched air is very useful, because it allows divers to stay submerged longer with no symptoms of decompression. If you are considering taking the enriched air nitrox course with Key West Diving, here is a quick QandA on the diving class. Scuba diving nitrox is the best choice for optimal diving conditions. Regular air is comprised of 78 percent nitrogen, 21 percent oxygen and 1 percent other gases. Scuba nitrox is air with higher-than-normal levels of oxygen. The high oxygen levels suppress the proportion of nitrogen in the mixture. This means your body absorbs less nitrogen, which extends your dive time and reduces the risk of decompression sickness. There are many benefits of taking an enriched air nitrox diving course. With Key West Diving, you can earn college credit for taking the class depending on where you are located. To find out if your local college or university accepts the course for college credit, simply contact the college. Enriched air diving also benefits many other types of diving, such as wreck diving, deep diving, underwater photography and master scuba diving, by increasing submersion time. The class can also be applied toward the master scuba diver certification. What techniques are taught during the course? 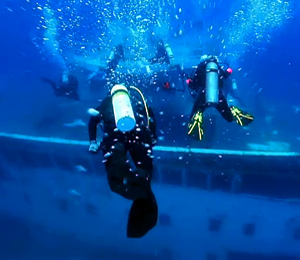 During the nitrox diver course, you learn the proper methods to use the enriched air technique to dive for longer periods of time and reduce risks of decompression sickness. You learn air considerations, such as how to manage oxygen exposure. You also learn important, fundamental equipment considerations. For example, the course teaches you how to tell what is in your scuba tank and how to set your dive computer. What are the requirements to take the course? There is a minimum age requirement; you must be at least 12 years old to take the course. There is also a prerequisite certification called open water diver that must be earned before you take the class. An equal qualifying rating from another certified institution may fulfill this requirement as well. Materials needed for the diving course include an enriched air diver crew-pak, and essential equipment includes basic scuba gear and a dive regulator. This is just a short QandA guide concerning the enriched air nitrox course offered by Key West Diving. If you want to learn more about the class, don't hesitate to contact Key West Diving today.